The Moody 45 DS proves boat builder Hanse has used technology and free-thinking design to produce a craft with no allegiance to the past. On a day the breeze was much less than 10 knots, still the Moody 45 DS was sweet to handle. Modern marine electronics add to the user-friendly feel of this Moody yacht and the gauges are positioned thoughtfully for the skipper. If you put the Fjord 40 powerboat and the Moody 45 DS side by side you could be forgiven for thinking they share the same hull. It’s a silly notion but there is some substance to it-Fjord and Moody share an owner, Hanse of Germany, who has made the bluff, aggressive look their trademark. 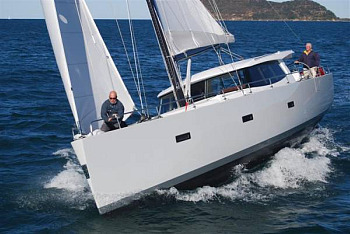 Hanse began only in 1993, and until 1997 it built unspectacular craft. Then, according to yacht designers and engineers Judel & Vrolijk, they devised a way to make hulls with beamy sterns work, and the Hanse portfolio since 1998 shows how they developed the blunt-bow, beamy- stern look. The bigger Hanses are quite ‘slab- sided’, a look that Hanse wanted for its Fjords. Now that look adorns the Moody 45 Deck Saloon. British architect Bill Dixon, who designed Moodys before Hanse took over the 150-year- old company, drew the 45. Bill has given the Moody the Hanse/superyacht look favoured by the Italian Wally superyachts: slab sides, high freeboard, bulwarks, teak where possible, and slabs of ‘glass if you need a superstructure. Bill has designed an 82-footer on similar lines; American designer Bill Tripp drew a 50m Wally which looks like a Moody 45 times three. I like this look. The big Hanses, the Fjord and now the Moody remind me of those World War I battleships ploughing towards the camera, smashing the seas aside and daring you to get in the way. The Moody’s theme is one-level living. Like some powerboats and catamarans, galley and bar are at the rear end of the saloon just inside the sliding patio doors, which lock at 100mm intervals. This means that when the weather is right you can have a sort of incremental environment; you can sit in the saloon on the settee, or under cover in the cockpit, or right down the stern in full sun. Oh, there’s a sliding sunroof in the coachroof, which confers even more control over how much of the environment you wish to experience. The sleeping area is on the lower deck-three cabins, two bathrooms, one en suite with the master cabin forward, the other in the starboard side, which acts as the day head. Some of Hanse’s success must be attributed to its allegiance to the self-tacking jib which takes so much of the effort out of sailing and helps encourage families who may be deterred by what they see as the unnecessary hassle involved in sailing. The 45 DS’s self-tacker contributes immeasurably to the boat’s calm demeanour. A lot of other features contribute, too. There are only two winches, Lewmar #54s with electric power, which handle the control lines. They raise the mainsail, unfurl and furl the jib, adjust sheet tension if needed, and control the ‘gennaker’ sheets when sailing off the wind. (A gennaker is a cross between a genoa and a spinnaker and is mostly used when sailing downwind). When you go forward the raised bulwarks provide security. The superyacht influence is reflected by the fact that the jib furler is buried out of sight, the chainplates are recessed, the cleats retract into the gunwale, and the anchor lives in a locker on the foredeck. To deploy the anchor you step on a lock, a strut partly lifts the arm, which carries the anchor, then you push the arm up through the vertical until it is horizontal. Then you lower and raise the anchor with the aid of the Lewmar electric windlass. The anchor is a Lewmar plough style with 60m of stainless steel chain. Between the helm stations are two hatches, which open to reveal the tackles, which lower the landing platform. They also reveal a huge full-width lazarette, into which you put the tender, preferably an inflatable I suppose. The outboard goes in a locker under the port helm seat. There’s room for the dive tanks, even a sailboard, says Dixon. How does this Yacht handle ? The Moody is presented as a luxurious craft, which in the old days (whenever that was, I’m not sure any more) may have been tagged as a motor sailor, but that would be to insult this craft’s abilities. This bulky hull has only a modest keel (draft is 1.99m, though the options list includes a lifting keel), and she is quite beamy, both overall and in the stern. Dixon gave her twin rudders, and a skeg to handle the propeller shaft. But the pointy bit at the front is sharp enough and she sails as a real yacht should-she points high into the wind, heels moderately, and steers brilliantly. She doesn’t have a lot of sail-the self-tacking jib limits sail area-so she flies in a blow; Windcraft have carried full sail upwind in 20-25 knots. We had a lovely sail on a day when the breeze peaked at 10 knots, and was usually much less, and still the Moody was sweet to handle. This boat was fitted with the optional 110hp Yanmar auxiliary, good for 8.8 knots, but the team at Windcraft feel the standard 75hp would be enough. The Yanmar lives in a genuine engine room; you need to crawl a bit but you can get at all parts of the engine. The steering is out of this world. It is a rack and pinion system, but twin pedestals and twin rudders usually take some of the fun out of driving. This steering is light with great feel. The skipper can pretend he’s in the America’s cup, lost in his own world of wind and water and the interaction between the two, tacking, gybing, bearing away unassisted, while the party rages in the cockpit. The nice thing bout twin rudders is that if you over-press your boat-too lazy to reef the mainsail, perhaps-the rudders make sure the hull tracks straight. This Moody’s interior is completely modern but the mahogany trim is slightly reminiscent of a London gentlemen’s club, an echo perhaps (I like to think) of the great history that Moody represents. American cherry is available, but I like the way this boat is presented, with the standard red upholstery. The Moody is a 45ft boat with the amenity of a 60-footer. The cabins are big enough and with good headroom for overnighting, the saloon/cockpit can accommodate plenty of bodies for day sailing and entertaining. The price of fuel means that powerboat designers will continue to create more efficient boats. So powerboat designs will change but it is interesting to note that yacht design is changing too and making sailing craft more accessible, easier to use. Perhaps the two streams, so violently opposed for more than a century, will someday meet on common ground. The Moody 45 DS goes a long way towards closing the gap.